Hail Varsity's Greg Smith, Jacob Padilla and Derek Peterson offer three final thoughts on the Huskers' 31-24 overtime loss to Northwestern. Another week, another game filled with poor execution, strange play-calling and the Huskers not being able to get out of their own way. This game was not without opportunities for Nebraska to take control or put additional points on the board. The 18-play drive that resulted in a field goal was disappointing as Mike Riley said in the post-game press conference. Disappointing is also how you’d describe having the chance to slam the door on the game only to throw an interception. Tanner Lee summed up those disappointments well after the game. It’s near impossible at this point to discuss micro (the Northwestern game) without discussion the macro (Riley’s future). There are a lot of stats from this season or during the Riley tenure that jump out to you and can give clues to which way this is all heading but there is one in particular that I can’t escape after yesterday. Nebraska is now 2-4 in their last six home games. Those four losses came to Northern Illinois, Wisconsin, Ohio State and Northwestern. Teams used to have something to fear when they came to Memorial Stadium. Now, when they beat Nebraska, they chant “beat Penn State” like Ohio State fans did or they chant to celebrate going to a bowl game like Northwestern did yesterday. I don’t recognize what Nebraska football is right now. Nebraska scored two offensive touchdowns on Saturday and they came from some unlikely sources. Heading into the game, redshirt freshman tight end Jack Stoll and junior walk-on wide receiver Bryan Reimers had one catch apiece this season. However, late in the first half, quarterback Tanner Lee dropped back and hit Reimers on a post route from 22 yards out to get Nebraska on the board and tie the game at 7-all. In the second quarter, following a 40-yard gain on a jet sweep by J.D. 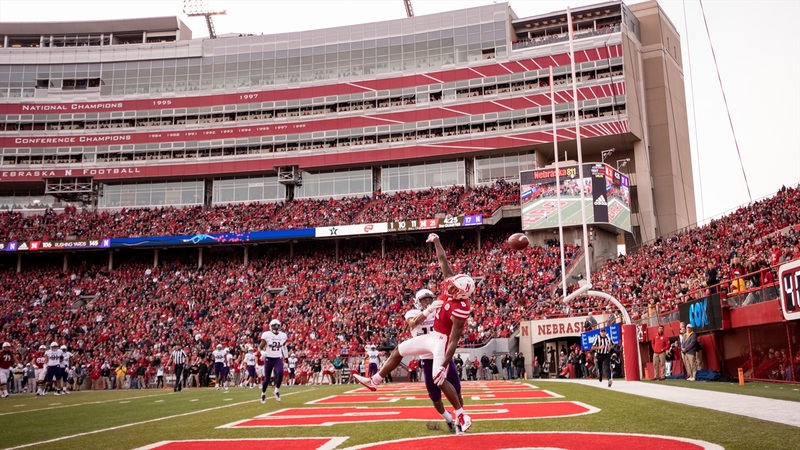 Spielman, offensive coordinator Danny Langsdorf dialed up a play-action roll-out pass, and Lee hit Stoll in stride from 32 yards out to knot that game again at 14-14. Reimers has dealt with some injuries and missed some time this season, but he caught five passes for 75 yards and a touchdown as a sophomore. At 6-foot-5, he brings a different dynamic to the table than the rest of Nebraska’s receivers and Nebraska put his height and catch radius to good use in the red zone. As for Stoll, his first career reception, a 12-yard gain, was on a pass in garbage time by back-up quarterback Patrick O’Brien. Saturday was the first time he saw significant action on offense as anything more than a blocker, and he responded with three catches in total for 41 yards. However, Stoll said he couldn’t quite enjoy his first career touchdown. Win or lose, when Nebraska called on Reimers and Stoll to perform, they answered the bell. Does 1957 mean anything to you? It shouldn’t, but here we are, at the point in the season where I actually have a use for going back through the history books and looking at the doldrums of Nebraska football. We’re talking before The Streak, before Devaney, before Nebraska really became what we (thought) we knew it as. Since 1950, Nebraska has lost five home games in a single season twice: 1950 and 1957. The latter is the last time it has happened. That’s in danger of no longer being true. This 2017 version of the Huskers is now 2-4 in the comfy-turned-stressful confines of Memorial Stadium following Saturday’s loss to Northwestern. When Nebraska returns from its two-game road trip it will close out its season against an Iowa team that: A) has outscored Mike Riley-led Nebraska teams 68-30 in two games and B) just layed down an old-fashioned whooping on previously sixth-ranked Ohio State. There are legitimate questions as to whether the Huskers will miss a bowl game for the first time since 2007, but it’s time to talk about another, more pressing issue. Nebraska hasn’t lost four straight home games in a single season since before The Streak began, in 1961. If it loses to Iowa on Nov. 24, it would mark four straight, and five total. When Bill Moos took the athletic director job in Lincoln, he said he didn’t come to go 6-6, he probably didn’t envision seeing so many losses inside his own building either. Nebraska’s home struggles weren’t discussed following the overtime loss Saturday. Riley’s future and the team’s mindset were bigger issues that needed addressing, but the fact of the matter is Riley is about to join rarified air. And not the good kind.